The disconnect between security officials in New York and Washington over the alleged subway bomb plot is reminiscent of pre-Sept. 11 days and has left many people confused. Should they be concerned about using the New York City subway system? Whom do they trust? 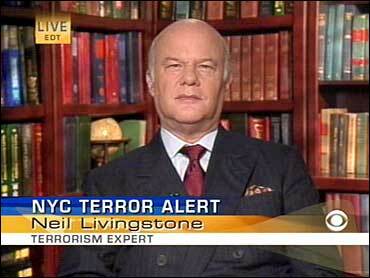 "I think I would trust the mayor and the police commissioner," Neil Livingstone, a security and terrorism expert from Washington, told The Early Show co-anchor Harry Smith Friday morning. "Certainly you've got one of the best police commissioners in the country in New York City and they made the determination, having seen the intelligence, that this is a serious threat," Livingstone said. "And they're taking steps to try to prevent an attack there that could kill or maim dozens if not hundreds of New Yorkers. I think I would go with the people on the ground there." Officials in New York revealed the threat Thursday, saying an FBI source warned that terrorists had plotted to bomb the subway in coming days. But Homeland Security officials in Washington downplayed the threat, saying it's of "doubtful credibility." Mayor Michael Bloomberg called it the most specific terrorist threat that New York officials had received to date, and promised to flood the subway system with uniformed and undercover officers. "Obviously, one part of the government is not talking to the other," Livingstone said. "Certainly there's no consensus. There's perhaps not an adequate sharing of information because how could New York basically end up with a different analysis than the Department of Homeland Security? So this really demonstrates what the problems are within the government right now — and in our intelligence community. And we've got to get this right." Livingstone said this was the time for the president to intervene. "I would call in (Secretary of Homeland Security Michael) Chertoff and the Department of Homeland Security. I would call in my FBI director, New York officials. I would say, 'Guys, what's going on here? This is — this doesn't give the public any confidence.'" If officials don't reach a consensus on threats like this, Livingstone said, "the public is basically going to tune you out, and that is a really a formula for disaster in the future because you need the public cooperation in support for these measures." The New York Police Department boosted existing measures to search for bombs in commuters' bags, brief cases and luggage. The threat also involved the possibility that terrorists would pack a baby stroller with a bomb, a law enforcement official said, speaking on condition of anonymity.